Today's post will be reviewing a premium brand of grain free dry dog food called Pooch & Mutt and I will be assisted by my little helper Miley to give her thoughts on the product. 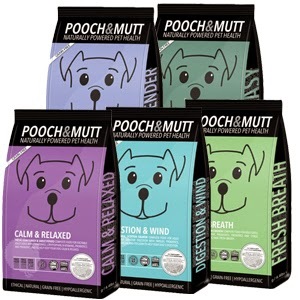 There are five different types of food to choose from depending on your individual dogs needs which are: calm & relaxed, digestion & wind, move easy, slim & slender and fresh breath. So now we have looked at whats in the food, let's see how it goes down with one of my toughest food critics! I was kindly sent a huge 2kg bag to sample and the feeding guide suggests that for a dog of Miley's size they can have around 130-250g per day so you're looking at between 1-2 weeks worth of food. The minute I put the bag down to take a photo she was over there giving it a once over and curious to see what was inside. And then success! She tucked in and seemed to really like the food, gobbling it up nicely. I think it's safe to say that Pooch & Mutt definitely have Miley's seal of approval (and by extension mine of course). I'm really pleased to have been introduced to the brand as it wasn't one that I was familiar with before. I hope you enjoyed this post as much I enjoyed writing it. Thanks for reading and speak soon! Great photos, especially the one where she is sniffing the top of the bag! Miley is so cute! We love Pooch and Mutt's product - their Bionic Biotic supplement has really helped with Bruce's itchy skin issues.